Despite a sudden Nor’easter, nearly 700 New Yorkers joined us on November 7th to honor the accomplishments of artist Jack Pierson and photographer Patrick McMullan at the Coalition’s 18th annual ARTWALK NY. Although the storm peaked just before the start of the event, it didn’t deter our dedicated ARTWALK attendees! Several guests remarked that the severe conditions outside reminded them why everyone was there: To help the record number of New Yorkers trapped in homelessness and to raise awareness about their plight. As guests arrived at 82 Mercer they were greeted by restaurant tasting stations hosted by Indochine, The Odeon, Michael’s, The National, Macao Trading Co., and David Burke Kitchen. A selection of wines was generously provided by Brancott Estate and specialty cocktails by the evening’s liquor sponsor, Belvedere. Guests traded stories about that night’s storm, the previous night’s presidential election and the previous week’s terrible hurricane. They then began bidding on the more than 100 stunning pieces in the silent auction. Highlights included works by Jonah Freeman and Justin Lowe, Shelter Serra, Bill Jensen and Lola Montes Schnabel; prints by Raymond Pettibon, Marcel Dzama and Pat Steir; photographs by Patrick McMullan, Patti Smith and Robert Longo, to name a few. The highlight of the evening was the live auction. 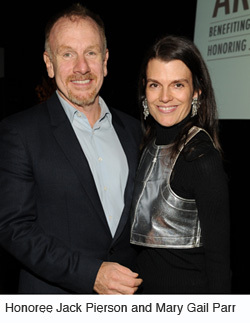 Guests heard special remarks from ARTWALK honorees Patrick McMullan and Jack Pierson, who spoke movingly of their admiration for the work of the Coalition and their concern and compassion for the tens of thousands of men, women and children suffering the trauma of homelessness in New York City. 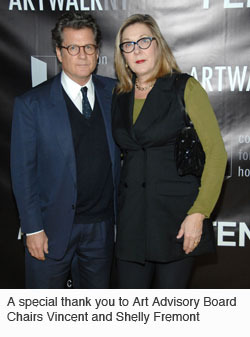 Their inspiring words were followed by a thrilling live auction, led by auctioneer Aileen Agopian, which featured exquisite works by Jack Pierson, Patrick McMullan, Louise Fishman, Barnaby Furnas, Wade Guyton, Jenny Holzer, Kim McCarty, Roxy Paine, Ed Ruscha, Andy Warhol and a unique commissioned portrait by photographer Adam Fuss. The live auction alone raised an astonishing $400,000 – a new record for ARTWALK! Following the excitement of the live auction, guests returned to finalize their bids in the silent auction while DJ Donna D’Cruz kept everyone entertained through the end of the evening. We were inspired by the hundreds of ardent Coalition supporters who overcame the brutal weather to help us raise $900,000, making this our most successful ARTWALK to date. We are truly grateful to our generous sponsors, artists, Art Advisory Board and Benefit Committee members whose amazing efforts made this year’s event possible!